We're just over a week away now from the new-look Brickset being launched. This will be a landmark in the site's development and will finally confine 'Brickset blue' to history. I know many of you will miss it and claim that the site is 'too bright' without it at the sides, but I do wonder, those of you that say that, don't you visit any other sites? Virtually every mainstream popular site these days is all-white: Google, Yahoo, Amazon, eBay, BBC news, CNN, you name it. Even Eurobricks and MOCPages are. In 1997, Internet users, using dial-up links, were provided with web space for a 'home page' by their Internet Service Provider. I used mine for LEGO-related content and the 'Promotional LEGO set reference' was just one aspect of it. 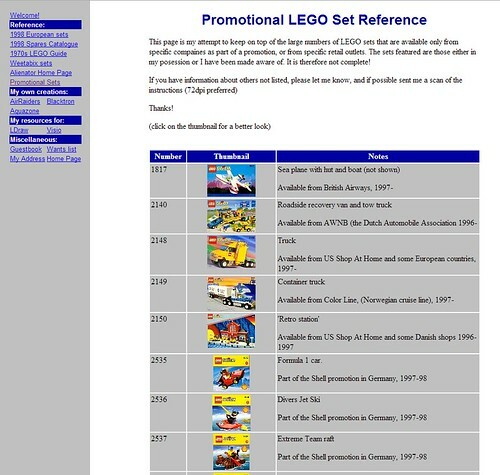 At that time, many LEGO co-promotions were running across the world and this page was my attempt at keeping track of them. The earliest reference I can find to it at Lugnet is in November 1998. 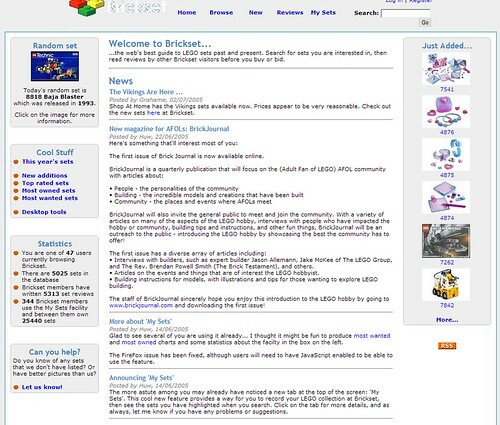 On 4th December 1999 (see Lugnet announcement), the site moved to brickset.co.uk (now a link farm) and by this time contained regular sets as well as promotional ones: 1959 of them -- a fifth of today's total -- according to this screenshot from the Wayback machine from March 2000. 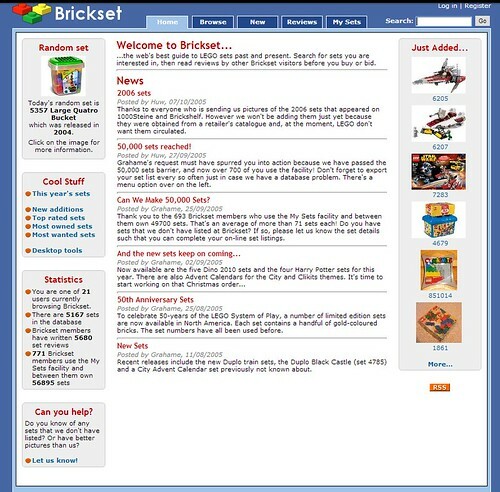 On 14th July 2000 Brickset became a .com, as announced at Lugnet, and underwent a redesign. The main new feature introduced at this time was user reviews: reviews written in 2000 are still in today's database. 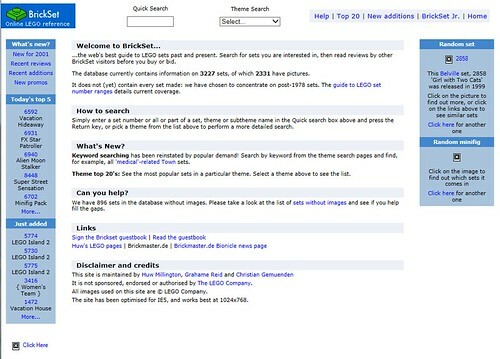 In 2002 the site was rewritten in ASP.net and had its design tweaked again. We started posting news on the home page, but users couldn't yet comment on the articles. Another redesign in 2004, but still no news comments. Yet another rewrite in 2005. I think this marked the start of the Brickset blue header and sides but they haven't been rendered in the Wayback machine's copy of it. More importantly, it introduced the ability to record your collections on the site, as announced on the home page. In 2007, several significant things happened. First, the database was moved onto SQL Server in January: incredibly it had been just an Access MDB until that time. 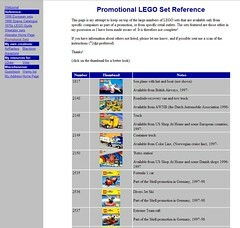 Second, affiliate links to LEGO.com were added, shortly followed by Amazon and eBay. Users could finally comment on news articles and lastly, in June, the entire database was lost due to a failure of the SQL Server and unusable backups. Luckily I had offline copies and it was up and running again fairly quickly without much data loss. This is is why the first news article in the current database is this one. The site as we know it today was launched on 26th December, but not without issues, according to the comments on the announcement. The rewrite provided a stable platform which has stood the test of time and enabled me to continue to enhance it, although the techniques and technologies used are making it difficult to do so now. In January 2009 the site had 13,000 unique users per day. Now it's 53,000. On 3rd February, the new Brickset design will be launched, the first one in 5 years. I think you'll agree that it's long overdue, even if you have grown fond of the current look. Its launch won't be the end: it will be the beginning of a new era for the site and as long as you continue to visit, I will continue to develop and enhance it. I hope you enjoyed that potted history. If you want to view and browse the old versions, visit the Wayback machine. Finally, I should take this opportunity to thank everyone that's helped with the site over the years, particularly Grahame, who mostly works behind the scenes on the database, and who's been doing so virtually since day one. Brilliant idea. Since I`ve been a member for quite a time now, I remember some of these "retro" designs. Wow, just great to see the progress that's been made on this site and to see how it's evolved over the years. Fantastic job Huw and the brickset team! We really appreciate all the work you've put into this site for the benefit of thousands of Lego fans worldwide. Keep up the good work! 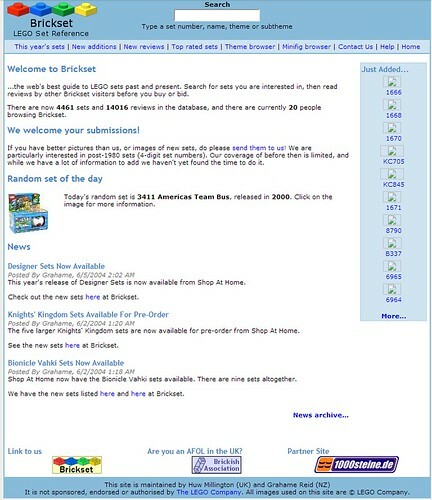 I never knew the site went through all those changes and it's amazing to see how the small simple site 17 years ago has grown in to the Lego community and fan page it is now. Must admit, I will miss the. Any blue background which will probably take me a few days/weeks to become adjusted to genes version, but this sounds very exciting plus the current format is nearly 10 years old now. Thanks for he report Huw. I really love how the new site turned out - especially on my mobile devices. Thank you for all your hard work! Well done creating the top Lego fan site in the world. A lovely website, and I love how it all came about. Perhaps on special occasions the blue can come out to play; for a short while at least!! It's great! Well done to all concerned! Just out of curiosity @Huw (and this may be common knowledge, so apologies if this is a dumb question), do you have a day job and Brickset as a hobby, or is this a full time role? I think the colour scheme of the new design is a bit "in your face" but it'll grow on me I'm sure. The thing I like most about the redesign is that it's much more mobile/tablet friendly, which in this day and age is just as important as ensuring it renders correctly on a desktop. A fascinating look back. Sure there will be complaints about the 'new' site... but they'll/we'll get use to it. Thanks for all the effort in being a cornerstone of our hobby. Thanks, Huw, for maintaining a modern and up-to-date LEGO set database and fan site, even as the pioneering sites of the hobby have slowly crumbled into dust. As a LEGO fan and set collector, I very much appreciate your efforts on behalf of the community. Kudos! @oldfan, yes the casualties of time have been many, including Lugnet, Fibblesnork, Peeron, and Pause,com, remember that one? I see Lou Zucaro still runs it, but it started out as a LEGO site IIRC. @BooTheMightyHamster, since 2012 it's been a full-time role. There's no way I could run it to the standard to which you've become accustomed now if I had a proper job as well! @kartula, because having coloured sides was never part of the design brief, the structure of the page actually makes it quite difficult to have them so I don't think they'll be making a comeback any time soon. Glad to be part of the Lego community. Nice history write-up, Huw, and thank you so much for making this site such an epic place! Yes, thank you Huw, very much appreciate the site and the work that goes into it. I have been a member of the site for about 5 years and a casual browser for many more. Such a great resource to the LEGO community. This article brings a smile to my face. A similar feeling to the moment I watched Kjeld Kirk Kristiansen congratulate you on this terrific site :O) Here's to another 17 years Huw; years that will hopefully include less redesigns and NO database loss! I think a LEGO-Award for Lifetime-Achievements is due here. Anyways, congrats on this great Site, which is without a doubt a Centerpiece of the worldwide LEGO-Community. Wow Huw! This is an awesome look through the years! I remember finding Brickset in 2009 with that old design! Back then I was only 13 years old! 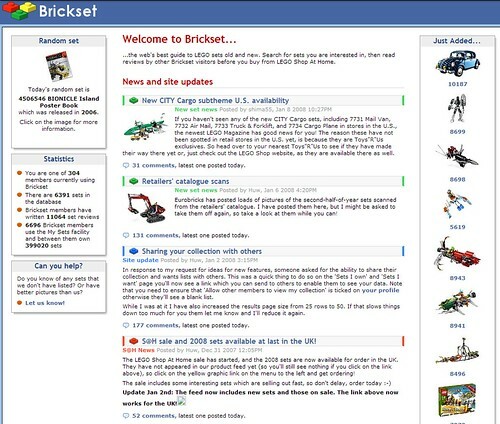 I remember finding it by typing in Google, "List of all the LEGO sets ever sold" Brickset was the first site that popped up and was probably the beginning of me talking the LEGO hobby seriously. Thanks a million for this site. It was my first connection to the LEGO online community and I still check it almost every day. The new design is great and, although it will take a while to get used to, I'm excited to use it! I see I joined the party quite late, however I enjoy it so it looks like I may be hanging around for a while! I would like to echo lots of other people in thanking @huw and everyone else involved with the site, job very well done. 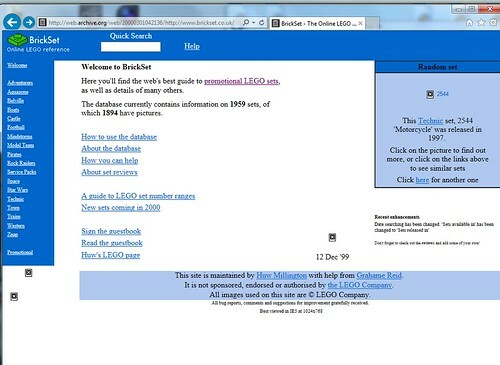 I started using Brickset around 2003-2004 and love the simple yet effective way to browse the information. Btw. little typo in the passage of 1999: In the first sentence you write 4th December 2009, shouldn't that be 1999 as well? ^I think it was supposed to say 2000. Thanks for the great work creating and running this site! Keep going the awesome work!! Great article Huw, it is very interesting to see what the site looked like before I first found it way back in 2005. The changes have certainly been dramatic in a relatively short period! Wow...it used to look OLD. The old ones remind me of the Bricklink site...when is that going to be updated? 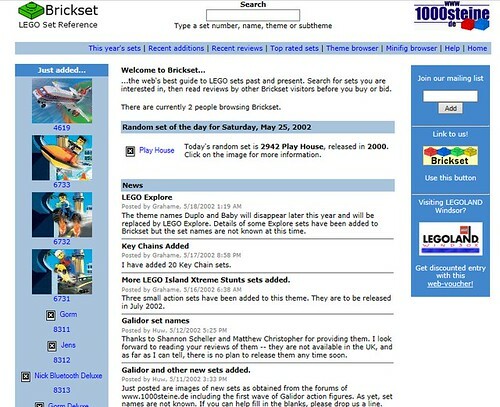 Never knew Brickset existed in 97. Been knowing the site since 2004 I think. Amazing walk down memory lane, and looking forward to seeing the new site go live. Muy bien hecho! I think it would be really Great if you add another filter option so we could sort the sets by Price Per Piece. Huw. So many thanks to you and Bricset for bringing me out of my Dark Ages. I have a hobby now that my wife and children can do with me. I had golf before this, and that's way more portable, but a lot more stressful and way less creative. Thank you for what you do. Very interesting I've always wanted to see what brickset first looked like. Here's to the next 17 years! Thanks for the nice trip down memory lane Huw. I was here from day 1. I still remember pause.com and before that alt.toys.lego and the days when you were working in air control. Eeek! Showing my age. This was quite a nice post to have seen! Thanks for sharing the history. I only started using Brickset around 2010-2011, but it's great to see what it was like before that. I am one of those you mentioned that like the old Brickset Blue. I cannot comment for others. I have compared it directly to other "white sites" that I use daily on side by side monitors. For some reason I cannot put my finger on, the new Brickset site is just too white. I don't know why, Maybe the layout with the other colors. Either way after a short time on the new site my eyes are very stressed and that does not happen with any other site. You asked for feedback and that's all I can give except if it was me, I wouldn't necessarily want to look like everybody else's mainstream site. Otherwise good luck with the site. Looks like Brickset and I were born the same year. It's cool to see how the site progressed over the last decade and a half!